Ramirez's dwarf cichlid is sensitive to water quality, so you will need to carry out regular, partial changes; it also prefers well-planted aquariums with plenty of hiding places. The female lays between 300 and 400 eggs on a flat stone. 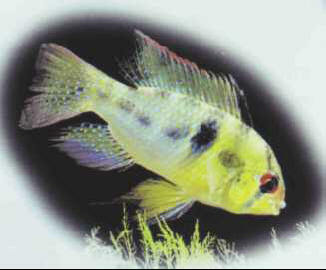 There is also a golden (xanthochromic) variety of this species, arrived at by artificial selection. Size: 6 cm. ЧОРОХ (Чорух) (тур . Coruh), река в Турции и Грузии (низовья). 438 км, площадь бассейна 22 тыс. км2. Протекает по Армянскому нагорью, впадает в Черное м. близ Батуми. Средний расход воды 285 м3/с. Используется для орошения.